I am honored to be participating in this year’s Christian Community Development Association (CCDA) “Locked In Solidarity” event, a national advocacy and action week for mass incarceration. Next Thursday, February 8 at 1:00pm CST, I will present a webinar – “Trauma-Informed Responses to Violence” – with EJUSA Executive Director Shari Silberstein and our Trauma Network manager, Lionel LaTouche. We are proud to announced the formation of the new EJUSA Evangelical Network. It is comprised of Evangelical leaders – from across the nation and political spectrum – who seek to transform the justice system by promoting responses to violence that are rooted in the values of racial equity, healing, public health, and restoration. Their letter, released today, described Easter as “a sacred day when Christians celebrate Christ’s triumph over death,” noting the “unfortunate timing” of the executions. Notable signers of the letter include many of EJUSA’s longstanding Evangelical partners and allies, such as pastors of mega-church congregations, theological scholars, religious authors, and more. “To allow a drug’s expiration date to dictate when an individual will die shows a troubling disregard for the sacredness of human life,” the letter says. This past Wednesday, EJUSA co-sponsored a discussion on the death penalty at Northland Church in Longwood, Florida. We were thrilled to be able to help bring this conversation to Northland – one of the largest Evangelical churches in the nation. Pastor Joel Hunter moderated, and EJUSA Organizer Christine Henderson made the trip from Jacksonville, FL, to share our vision of a criminal justice system that heals and restores lives. The panel consisted of two people who have come face to face with the death penalty in their personal lives and two people who discussed the theological implications of the death penalty. EJUSA is proud to be sponsoring and organizing a exciting event at Northland Church, Florida’s largest evangelical congregation. 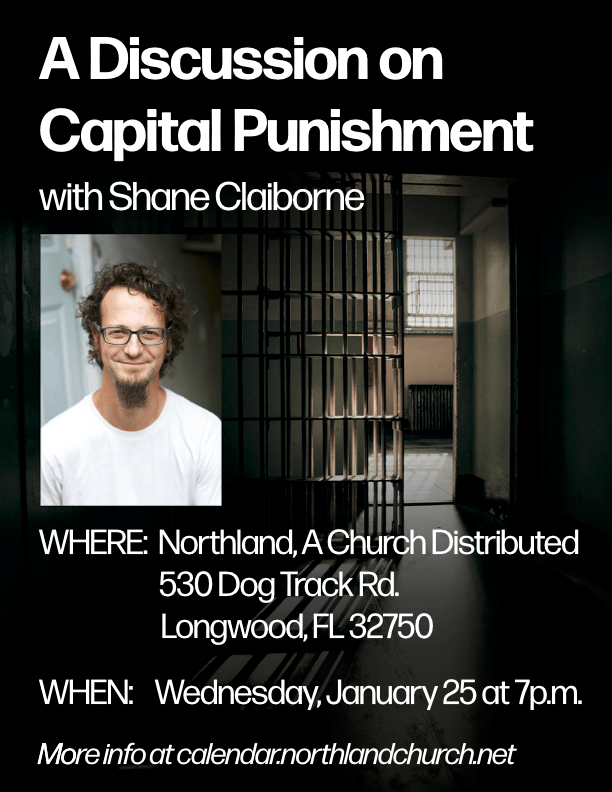 Northland Pastor, Dr. Joel Hunter, will moderate a discussion about the death penalty with author and activist Shane Claiborne, Florida death row exoneree Herman Lindsay, and Darlene Farah, whose daughter, Shelby, was murdered. Texas is scheduled to execute Wood on August 24th for his role in the murder of Kris Keeran. But Wood wasn’t even inside the gas station where Keeran was working as the clerk. He was sitting in a “get-away” truck outside. Wood had no previous criminal history and suffers from borderline intellectual functioning and mental illness. In college, Senator Colby Coash celebrated at a tailgate party outside of a prison during an execution. Now he’s part of the growing conservative movement to end the death penalty in the United States – a movement that EJUSA’s Conservatives Concerned About the Death Penalty has helped spawn. Read The Washington Post’s in-depth article about this trend and EJUSA’s impact, featuring interviews with EJUSA staff members Heather Beaudoin and Marc Hyden, who lead Conservatives Concerned. Is anyone beyond redemption? What does true justice look like? Does God support capital punishment? 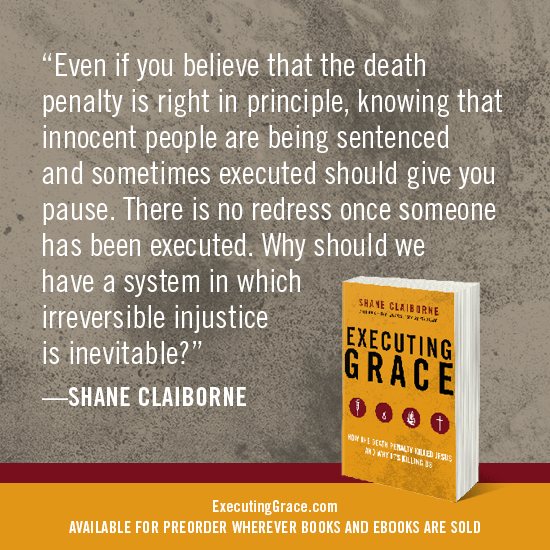 These are a few of the questions raised in a new book, Executing Grace, by Shane Claiborne. The book was released yesterday and is available at your local (or online) bookstore.